Depression - this one is obvious, and it's a mixed bag. Jumbled together with this, in the spaghetti bowl that is my psyche, is the ongoing and often exhausting work of recognising and dealing with the effects of long-term abuse. The depression itself was in fact a symptom of not dealing with all those things... and wow, depression is not fun. June to August was a bad time for me and I'm sure it wasn't helped by the fact that it was winter. Winter is NOT my favourite part of living in Melbourne! House hunting - I spent Nov/Dec 2007 and January/early February 2008 looking for a new rental home. It was a horribly degrading, tiring experience. I spent a lot of time traipsing around on stinking hot days looking at house after house. Real estate agents generally open rental properties once only, for a 15 minute inspection. If you don't come to the inspection you are not allowed to apply for it. If you DO come to the inspection, you are one of 50 or 60 people looking at the place. If the place is even remotely habitable and you decide to apply, you are then one of 50 or 60 people applying for the place. Of those, there are probably 20 or so candidates who fit whatever criteria the landlord and owner have in their heads. After that, it's just a game. The real estate agent might shortlist you, or they might not. Once they have a shortlist (usually 3 or 4 candidates) they take it to the owner and the owner chooses one. Their choice is based on... whatever they feel like, it seems. In some ways I was at an advantage because I have neither children nor pets, but also I was working part time and that was a definite disadvantage. I didn't apply for any place I couldn't afford but there's no doubt that someone earning $60K seems much more attractive to landlords than someone earning ~$37K. And regardless of how clean, polite, rich etc potential tenants might be, many real estate agents treat renters like scum. Sadly, the rental market is so tight that we are at the estate agents' collective mercies so it's not like we can rebel against the treatment. So yeah... house-hunting was a definite low start to the year. Counselling - this item will appear on both lists, but for the 'worst of' list I am referring to counselling sessions with my previous counsellor. It wasn't all bad, but there came a point where I realised she had gone beyond the point of not helping and was making things worse. I feel it's no coincidence that my depression continued to get worse while I was seeing her (as she repeatedly told me I wasn't depressed and just needed to force myself to do things) and then started to improve once I stopped seeing her and found a new counsellor who was better suited to helping me. The period where I was becoming more and more depressed and was getting more and more frustrated with my counsellor was a very difficult part of 2008. Depression - no, really! Obviously the depression itself was horrible, but reaching that low point was the catalyst that enabled me to seek help and start to face up to things in my past... and that's the beginning of getting better. Counselling - sometimes I hate it, but for the most part it's been so very helpful to me (once I'd changed counsellors). I'm on the road to healing and wholeness, and that's a great thing. My home - after the nightmare that was house-hunting, I was offered this place. It's not brand new and it's not glamorous, but it fulfilled every single item on my wish list/prayer list in terms of size, features, suburb, storage space etc AND it was $50pw cheaper than every comparable place. My home has been a haven to me and I'm very happy here. My job - I am the Office Manager in a medium-sized Anglican church. "Office Manager" is a bit misleading since no one else works in the office except me, but there you go, that's my title. My job also involves acting as PA to the minister. I work 4 days per week, ostensibly 28 hours although it's usually more. I have an organised mind... okay, borderline OCD... so this is a perfect job for me. More than that, though, I simply love working in a church. Well, I love working in that church. The other staff (minister, assistant minister, children's and families worker and one volunteer who comes in once a week) are all great; and the parishioners for the most part have been simply wonderful - loving, welcoming, helpful and fun. It's not a high-paying job, nor it is high-stress or high-powered, but I've had those high-everything jobs and they didn't make me happy. This job does, and that makes a very big difference to my general enjoyment of life. My home group/Bible study group -The people in this group are simply a gift from God. They've been a wonderful support as well as being heaps of fun. I continue to be enormously grateful for their love, their prayers, their wisdom and their humour. Blogging - more specifically, meeting new bloggy friends. You know who you are. 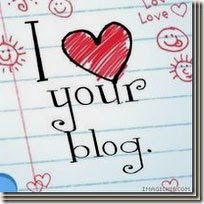 Getting to know you a little bit and interacting on your blogs and via e-mail has been a real high point for me. It's also made me blog more... that's a high point for me but I can't guarantee it's a high point for anyone else! God - no matter what else is going on in my life and no matter how I feel, God is good. He is infinitely loving, faithful and downright awesome... and He loves me. So that's my year. There have been ups and downs but that's what makes us who we are so I wouldn't change any of them. Okay, except maybe the horrible house hunting experience... anyway I'm looking forward to what 2009 will bring. I made this banana cake this afternoon. It was the quickest, simplest cake I've ever made - excluding packet cakes, obviously - and it was sooooo good I just had to share it with you all. I added an extra banana because I had 3 that were overripe and it made the cake extra moist and extra ....banana-y. It did mean it didn't rise much but I'm not precious about appearance. This is a Caesar Salad. But wait - it's not just any Caesar Salad. 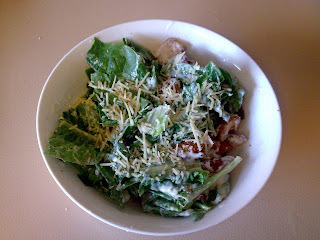 It's a Caesar Salad made with cos lettuce grown in my vege garden. Woot! 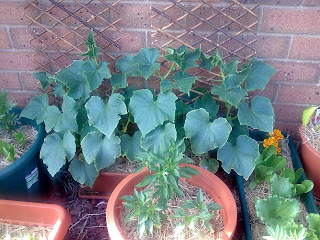 Q: Possums are eating the fruits and vegetables from my garden. What should I do? A: It is important to remember this is only a temporary problem. The possums will only remain while there is a fruit source for them. They will go when there is no fruit for them to eat. So... when they've completely stripped my garden, they'll leave. Yeah, thanks for that. Very helpful. Anyone else have any tips on how to deal with them? Remembering that I rent so I can't really build a greenhouse or anything. Is there anything more annoying than getting home from a party, tired and desperate for sleep, and realising that although you stripped your bed earlier to wash the sheets, you didn't remake the bed... and will have to do that before you're able to sleep? I'd like to say I've learned my lesson, but I must confess that this is not the first time this has happened. Ummm... nor is it the second time. I'm a slow learner. I've just had the first Christmas where I didn't see a single member of my family. I'm interstate from the rest of my family and I opted to stay put this year (which caused its own hassles, but that's a story for another day). Generally in my family we all get together at my parents' house for lunch. This is fairly unusual in itself - I'm one of five kids and my siblings all have partners and children and/or stepchildren, yet the Christmas Day celebration is still centred around our birth family, not their own families. Of course they still have their own celebrations but the main shindig is the one where we all get together. Let me put this in perspective - my siblings are aged 50, 48, 44 and 30 (and I'm 38) and between them they have 8 kids/stepkids aged from 25ish to nearly 4, plus 3 (step)grandkids... yet up to this point no one has said, "Hey, we're a pretty big family in our own right - we want to have our own Christmas lunch this year. Maybe the rest of us should get together on another day." I find it kind of astonishing, really. If this continues it's entirely possible that my nephews will grow up and leave home never knowing what it was like to have Christmas lunch in their own home. So this is what I was up against when I said, "Uhhh... guess what? I'm going to stay here in Melbourne this year for Christmas." My younger sister jokingly told me that I've RUINED CHRISTMAS... but then told me they've been wanting to have Christmas in the Philippines one year, with her partner's family, and she thinks I might have paved the way. Hey, that makes me a trailblazer! My parents' real concern was that I would be spending Christmas alone - they just didn't get the fact that being part of a church means I would only be alone on Christmas Day if I went out of my way to be so. As soon as people heard I wasn't going back to Sydney I had about 12 invitations... and even if I hadn't had invitations from people I know, my church works very hard to identify people who'll be alone and to hook them up with families who can fit another person or two around their table at Christmas. I haven't chatted with my family yet to find out what Christmas was like from their end. For me, it was incredibly relaxing. I suspect for many families, Christmas celebrations bring with them an undercurrent of tension. You're bringing together a group of people who have a long history together of the good, the bad and the very very ugly; and for many families, like mine, it's the only day of the year when you're all together in the same room. I keep in pretty close contact with my sisters but I only see my brothers on Christmas Day or if someone dies and we happen to be at the same funeral. This, of course, means that I also barely know my sisters-in-law. Christmas lunch tends to be awkward and slightly tense. My mother gets very stressed about the food preparation, my sisters spend a lot of time chasing after their kids and trying to stop them being maimed in drunken backyard cricket games, my step-nieces and step-nephews clearly hate being there because they haven't grown up with my family so we're virtual strangers to them, my brothers don't lift a finger to help with anything and invariably become drunk and very obnoxious, and my dad tries to keep everyone happy but usually ends up getting in trouble from my mother for... I don't know, breathing the wrong way. Of course, there are great things too. We have a long-running contest about the Christmas crackers - we take turns buying them and there's always good natured rivalry about the quality of the gift inside the cracker, as well as the corniness of the joke. ("How do you get down from an elephant? You don't - you get down from a duck." Ar ar ar.) There is the tradition of walking down the road at night to look at the house with the truly horrendous, tacky Christmas lights all over their house and lawn. There is the unspoken agreement that at some point during the meal someone will hand my mother a paper napkin and say, "How did you make those elf shoes again?" (One year she folded the napkins into the shape of an elf shoe. They were very cute but by the following year she'd forgotten how to do it, and every year she tries and fails. It's fun to watch... yes, we're cruel!) There are lots of fun things and I was sad to miss them this year... but underneath all that I was relieved to enjoy a Christmas Day lunch with people I love, and to spend several hours there without anyone fighting, getting tense, getting stressed, getting drunk. I didn't even know Christmas could be like that. I'm not saying it was a Hallmark Christmas, but it was still pretty good and I came home feeling sated, relaxed and loved. It was a good day. When the angels had left them and gone into heaven, the shepherds said to one another, "Let's go to Bethlehem and see this thing that has happened, which the Lord has told us about. "So they hurried off and found Mary and Joseph, and the baby, who was lying in the manger. When they had seen him, they spread the word concerning what had been told them about this child, and all who heard it were amazed at what the shepherds said to them. But Mary treasured up all these things and pondered them in her heart. The shepherds returned, glorifying and praising God for all the things they had heard and seen, which were just as they had been told. On the eighth day, when it was time to circumcise him, he was named Jesus, the name the angel had given him before he had been conceived. When the time of their purification according to the Law of Moses had been completed, Joseph and Mary took him to Jerusalem to present him to the Lord (as it is written in the Law of the Lord, "Every firstborn male is to be consecrated to the Lord"), and to offer a sacrifice in keeping with what is said in the Law of the Lord: "a pair of doves or two young pigeons." you now dismiss your servant in peace. and for glory to your people Israel." As Christmas approaches I've been reading of some lovely family traditions for Christmas. People decorate the tree together, walk around at night to look at the Christmas lights, leave cookies out for Santa, write letters to children from Santa... it all sounds delightful. Now let me tell you about my family's Christmas tradition. When we were children, at some point during the day on Christmas Eve my father would say, "Did you hear the news?" "No," we'd say, wide-eyed, "what news?" "There's been a storm," my father would say, "at the North Pole. It was just on the radio. Santa isn't going to be able to make it this year." We'd squeal and yell, "No, you're wrong!" Later on, when we'd established that yes, Santa would be arriving this year, my Dad would say, "I'm sick of those reindeer tearing up my lawn every year. I'm going to set a trap for them this year... see if I can catch one." A variation on this would be him walking casually into the room holding some rope. Curiosity would always get the better of us and we'd ask why he had the rope. "Oh, just setting a trap for the reindeer." And on Christmas morning, when there were clearly no captured reindeer, he'd say, "They got away! I came out here this morning and found hoof marks all over my lawn! And there was reindeer poo - eight of them... plus one red one at the front. That must have been Rudolph." I've told people these 'traditions' before and they generally look horrified that someone would traumatise their children in this way. Let me state categorically - we loved it and thought it was very funny. To this day my sisters and I will ring each other at some point on Christmas Eve and start the conversation with "Hey... have you heard the news?" It's considered a huge feather in one's cap if the other person is too distracted to work it out and responds with "No... what news?" So here's to weird family traditions - long may they continue! For the record, it was never a surprise party. 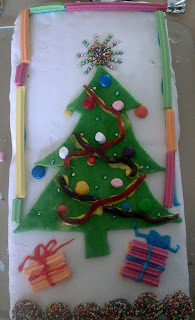 Below is a picture of the cake I made for our last Bible study of the year. 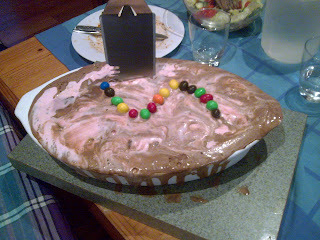 Unfortunately none of us really wanted to eat it because someone else brought Chocolate Ripple Cake for dessert (the super-delicious dessert made with Chocolate Ripple biscuits and cream and other delightful things - yum!) but never mind. It was still fun to look at it! And in other arty news... below is a painting I did the other day. 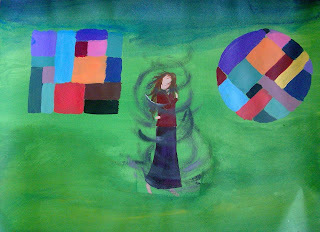 It's pretty dodgy, really - I wanted to get back into painting since I haven't touched it for months, but I didn't have any ideas, nor did I have a lot of time so I just messed around for a bit... it's actually a diagram my counsellor drew the other day to illustrate a point she was making. Only she did it with a stick figure and without the pretty colours! :) Anyway it was good to play with paint again and I think I'll do a bit of painting during my holidays after Christmas. I'm watching Carols in the Domain right now (on the television obviously, since the Domain is in Sydney and I'm in Melbourne). In the true tradition of stripping all religion out of a religious holiday, we've seen some pretty bizzare things at this yearly event - for a few years there they had a love affair with The Circle of Life, which is somewhat weird for a Christmas event. Particularly notable, though, was the year they had a couple singing Amazing Grace to each other like a love song. I kid you not. ...Man will live forever more because of Christmas Day. Til he appeared and the soul felt its worth. Watching this carols event I keep hearing the phrase "spirit of Christmas", by which they seem to mean 'family' or 'love' or 'togetherness' or whatever. It's all about being generous and being nice to each other. None of these things are bad... but is this what Christmas is really about? What do the songs say? God is righteous, loving, truthful, glorious and wonderful; and he rules the world. Jesus is the culmination of all humanity's hopes and fears. The world lay in sin and error, without hope until Jesus appeared. Because of Jesus, we can live forever. I am so sick of this watering-down of Christmas. Don't tell me "we need to be inclusive". I don't ask Jewish people to say "Happy Holidays" instead of "Happy Hannukah" because I think their religious holiday should include Christians also. Christmas is a Christian celebration. Yes, I'm fully aware that Jesus was not born on December 25; I'm also aware that Christians originally chose this date to coincide with a pagan festival. Those things don't change the fact that Christmas is about celebrating the birth of Jesus. Where did we get the idea that leaving Christianity in Christmas means we're not being inclusive? Christmas is all about inclusion... it's about God coming to earth as a man - and growing up, living and dying on our behalf so that everyone has the opportunity to be part of God's family. I know some people will find this offensive, but frankly, I find it extremely offensive to be asked to say "Happy Holidays" or "Seasons Greetings" when I want to be celebrating God's amazing love to us. "Joy to the world; the Lord has come!" No, not six more sleeps until Santa comes. Six more sleeps until my annual leave starts. Believe me, it can't come soon enough. Don't get me wrong; I love my job. When we had our Christmas lunch the other day my boss asked us all to name our highlight of the work year and mine was "landing this job" (I started work there at the end of April). It's a real blessing to work in a job I love - the people with whom I work are encouraging, friendly and lots of fun; and the parishioners who drop in (I work in a church) have embraced me warmly even though I worship in a different church. And I love working in a church... it's so great to chat about how things are going and then to pray together. Having said all that... I've had a rough year from a personal point of view and an exhausting year at work, as I've learned the job and invested a lot of energy and time into relationship building. I am tired. I am finding it harder to be patient and gracious in a job that requires a lot of patience and grace. I look forward to the weekend with almost indecent enthusiasm and I find it harder to get out of bed on the days when I work. I'm grumpy, and it's not always hormonal! So, bring on the holidays! I'll be off from Christmas Day until 14 January (three weeks - yay!) and I'm not going anywhere and I have no plans... except to recharge my batteries, and to return to work ready to run with endurance the race set before me. The parents have gone back to Sydney now and it seems we all survived. We spent most of the rainiest, yuckiest day playing board games and that was actually pretty good. As to how I survived... I sent a message to a friend on the weekend, saying, "I think I'm going to get a D-minus in counselling this week. What if my counsellor sacks me???" For the record, she didn't sack me and I don't think she was particularly surprised by anything I told her about how I handled things and how I felt. I said, "I barely slept, I have had chest pain for a week and after I dropped my parents at the airport I came home and threw up." She said, "Yep, that's pretty much what I expected." Well, good to know I'm reliable, at least! Thanks so much to everyone who prayed and left me kind messages. It was wonderful to know people were thinking about me. It's raining. It's going to be raining the entire time my parents are here. I can't do any touristy things with them because they don't want to go anywhere in the rain... unless we go hang out at a local shopping centre, which frankly they could do at home. I ask them if there's anything they'd like to do. They say they don't mind. They ask what I would like to do. I say I don't mind. I don't know where to take them or what to do with them. They are kind of happy just sitting at home and watching television, but then I feel bad that I'm not being a better host and I think they feel that they're intruding on my life and forcing me to entertain them. Underneath it all is the unspoken recognition that we are strangers who happen to have a lifetime of history together. We really don't know each other at all; and although there are valid (albeit complicated) reasons for that, it is still very sad. My parents are arriving today from interstate for a short visit - they fly home again on Monday afternoon. I have mixed feelings about their visit. I'm anxious and I don't particularly want them here, which makes me feel guilty and mean. But given our history, I'm not sure my feelings are entirely inappropriate. I have an uneasy relationship with my parents, for different reasons that tend to morph together. One reason is fairly ordinary parent/child relationship stuff. My parents are tremendously bothered that I'm not married, and therefore they tend to assume that (a) I'm missing out on... just about everything; and (b) I'm not a real grown-up and need to be looked after. These assumptions tend to manifest themselves as my parents treating me like I'm a little girl playing house. When I was still living in Sydney my father once dropped around right on dinner time to repair something for me. I was just serving up my dinner-for-one - as I recall, something fairly boring like fish and steamed veges - and he looked at it and said, "So... you cook for yourself, do you?" (Actually I've had a similar question from a number of people - the assumption seems to be that people who live alone get by with just a can opener and a spoon.) With my father, though, the question implied amazement that I cook for myself and that I'm able to cook. He expresses similar amazement when I do things like arrange for my car to be repaired or... move interstate... and every time I do something 'grown up' he grills me with the most ridiculous questions to try to catch me out and prove I don't really know what I'm doing after all. I know there is genuine concern and care behind it, but there's only so long a person can put up with hearing things like, "When you put your car away in the garage make sure you've turned the engine off before you shut the garage door" (so I don't die of carbon monoxide poisoning in the 3.5 seconds it takes me to get from the garage roller door to the side exit door that leads to my backyard). My parents must be constantly astonished that I've managed to live this long without serious injury. My mother tends to assume I'm missing out on everything and must be compensated. Actually my father thinks that too but he's too busy trying to keep me alive to do anything else. In my family we have stopped giving Christmas presents now - I have 4 siblings and they all have families of their own so we decided it was a ridiculous expense and was only causing us stress. I'm fine with it; in fact I was one of the instigators of this move. My mother, however, is horribly concerned that I won't get ANY presents for Christmas because I don't have a partner to buy me anything... so she said recently, "Well, I suppose we'll have to buy you a present this year, won't we?" Yes, that's verbatim. I assured her that I am very likely to get Christmas gifts from friends, and as a Christian the gifts aren't the most important part of the day for me anyway, but I think she remains unconvinced. I'm thinking now I should just milk this... "I'm soooo lonely and unfulfilled, but I know I'd feel better if only I had that red couch from Ikea... and maybe a flat-screen TV too. That would help to ease the pain..."
The other reason for my difficult relationship with my parents is more serious. Many of you who know me in real life are aware that I experienced long-term emotional abuse and bullying at the hands of one of my brothers. All siblings fight and disagree to a certain extent, but in my case my brother's behaviour was calculated, pre-meditated, sadistic and quite deliberate. - and it went on for about 15 years. In a few instances there was physical abuse - I once sported a particularly spectacular black eye - but for the most part his weapons were humiliation, belittling and disempowerment. (There's an okay article here about sibling abuse.) He was very good at what he did and I know there was a great deal that my parents didn't see. I think my father was probably oblivious to just about everything anyway as he was a shift-worker and was often at work or asleep during the times we were awake. My mother, on the other hand, was there and I know she saw at least some of what was going on... yet never intervened. It's possible she dismissed it as normal sibling fights and didn't really understand the extent or impact of what my brother was doing - this is one of the reasons sibling abuse is so little recognised or understood - but even so there are a few painful incidents where she simply failed to protect me. This abuse has had a profound effect on my life. It's affected my self-worth, my ability to trust, my confidence; and it contributed to the depression I experienced earlier this year. Praise God I have a great counsellor who has experience in abuse recovery and has been tremendously helpful. Healing is a slow process but it's definitely possible and I'm happy with the progress I've been making. As far as my parents are concerned, however... there's a lot of anger there and other mixed feelings. I've never discussed this with them and I don't intend to because it wouldn't be helpful (they would never recognise my brother's behaviour as abuse and trying to make them recognise it would completely destroy our relationship) but that means that when they decide to visit I am processing a lot of stuff and it tends to be a very anxiety-inducing time for me. Wow, this post is longer and more intense than I had intended.... sorry to make you sit through a counselling session! Many of you already knew this stuff anyway and I continue to be enormously grateful for your love and support. For those of you who are the praying types, please pray that I can get through this visit without unnecessary trauma. They're here for five days... and I think I'll be taking comfort in blogging a lot during that time. You have been warned! I inhaled half a block of chocolate and most of a packet of BBQ chips yesterday and was still hungry when I finished. I'm about a kilo heavier than I was three days ago. I've gone up a bra size in the past 24 hours. When I got to work this morning I discovered that someone had been into my office (not unusual - I work in a church so people are always in here on Sundays) and moved things around - in particular, my sticky tape was sitting on the windowsill instead of back on my desk. I was so enraged as I rounded up my stationery etc and moved it all back that for a brief moment I seriously considered looking for another job. I don't know... do you think it's possible I'm a teensy bit pre-menstrual?? This is a comparison shot of the photo from three weeks ago and a photo taken this morning. 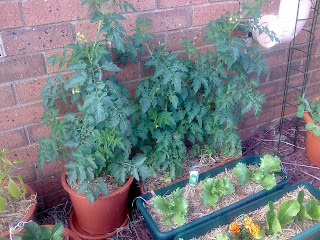 Grape tomatoes - there are loads of tomatoes under all the leaves. 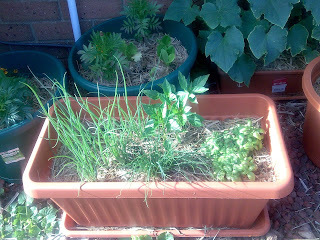 Spring onions on the left, chillies at the back, chives at the front and basil on the right. It's only a small garden and in truth I can't take credit for much of it since they are thriving just by being outside - this is what plants do, after all - but still it is deeply satisfying to watch my little garden growing and changing; and to know that it's producing things that will feed me. It's somehow primal. Write that sentence as your status. Copy these instructions as a comment to your status. Don't go looking for your favourite book, or the coolest one you have -- just grab the closest one. Mine was "It may not be convenient or comfortable." Today I spent some time watering and fussing around them, and was thinking how much they've changed since I took the photo that I posted on here. I considered reaching for my camera to post an update... but stopped myself when I realised I am like one of those parents who take pictures of their child every day (I have no problem with that) and then show them to you several times a week and expect you to comment about the differences between this photo and the one you saw three days ago (I have a teensy problem with that). So, I didn't take a photo. But as I nobly put down the camera I thought, "Boy, if I had real children I'd probably be unbearable..."
It's Thanksgiving, which we don't celebrate officially in Australia. We don't have the cultural history behind the holiday but I think it's still a great idea to think about things for which we are thankful. God, who loves me passionately, without reservation and without ceasing. Flannelette sheets, a hot water bottle and a good book on a cold and rainy winter evening. People who ask "how are you?" and really want to know the answer. The internet, which has allowed me to 'meet' some great people from all over the world. Awesome apricot jam made by that lady at church. My job, which doesn't pay particularly well and will never bring me glory, but which brings me great joy. My day off, which also brings me great joy! Poetry that shows me ideas I'd never considered; that speaks the thoughts I am unable to articulate; that shocks me; and that makes me laugh. My home which, although I only rent it, is a comfortable haven. Notebooks with thick paper and no lines. A good counsellor; and an excellent health system in Australia that enabled me to get appropriate help at the right time. Very ripe (but not over-ripe) nectarines. Okay, I admit it. I was going to use this article to hassle my Queensland blogger friends about being unfriendly (despite the fact that they've all been incredibly friendly to me... but maybe they're still distant with their actual neighbours). But anyway I decided it was probably wise to read the article before hassling them, particularly as it might even say that Victorians are the MOST friendly... that would be a real win. Well, no. It didn't say that. In fact, it didn't mention Victoria at all. Now, this struck me as curious. Is it because Victorians are so friendly that it would be redundant to state it? Or are Victorians so inherently unfriendly that they're completely off the scale? I'm smart. No, really... I can prove it. My degree arrived on Friday. Well, the certificate arrived, anyway - technically I qualified to graduate at the end of 2006 but it took me a while to get my act together to apply to graduate. In 2007 I started an Honours year but had some significant health issues during the year so decided it would be better to defer Honours for a while. I applied to withdraw in good standing, which means my Honours work stays on record at the university for ten years and I can re-enrol and finish it off at any time during those ten years. In most cases when you do Honours you graduate from the whole thing (the degree plus the Honours year) at the same time but since deferring Honours I was starting to feel like the preceding three years - the degree part - hadn't counted for anything. So, I decided to graduate from the degree, although I didn't attend the ceremony. Really not my thing at all... plus, it's an Arts degree and my surname is a fair way down the alphabet - I wasn't keen to sit for two or three hours waiting for the 20 seconds of glory when my name is called. I had mixed feelings when I saw the certificate. I didn't go to uni when I finished high school, so starting a degree at age 34 was in some ways the fulfilment of a dream. Still, I wonder about my real motivation when I decided to quit my job, move interstate and start a whole new life studying something that has no practical use in the real world (I majored in Classical Studies and minored in English). Although I went to uni largely for enjoyment - and I did love studying - there is a little part of me that wanted to prove something. To myself? To other people? I'm not sure. And what does it prove, anyway? That I'm intelligent? Well, not really - if anything it proves that I learned the 'secret' of good essay writing, which has very little to do with intelligence. It also proves I have a good memory, since much of my Latin and ancient Greek study was simple memorisation. Does it prove that I'm "as good as" the people who went on to tertiary study straight after school? Or perhaps "as good as" the people who worked in the exact same job as me but were paid slightly more simply because they had degrees... despite the fact that I trained them and I supervised their work (yeah, that one still rankles). This all makes me wonder why I need to prove something to other people, or even to myself. I doubt that it's just me; I think most people have a deep insecurity about their own worth. In some people this insecurity lies just below the surface and in others it's buried deep down but wherever it lies, it's there and it can have a profound impact on the way we think and behave. I suspect it's something with which I shall always struggle, but at the same time it is so incredibly freeing to find my worth in Jesus. God sees me through "Jesus-goggles" - because of Christ's death and resurrection on my behalf, God sees me as holy and blameless in Christ. He sees me as his loved and precious creation; he knows me by name and values me as ME, not simply as Nameless Christian #503,486. As happy as I am to have my degree, I am even more happy to know that I don't need a piece of paper to prove that I am of incredible worth to God. Over the past year I've had insomnia quite a lot... and it's a weird feeling. If it happens enough I start to feel like I'm in a completely different universe. Whatever happened during the day ceases to have relevance; and day and night haunt each other, particularly when I'm half asleep and it becomes difficult to tell what is a dream and what is real. Sometimes I feel like I'm the only person in the world who's awake. Maybe I'm the only one alive - everything starts to feel a bit surreal and my entire world shrinks to the size of my mattress as I toss and turn and look at the clock. No time moves as slowly as time spent in a futile attempt to fall asleep. I did my ironing today. ALL of it. It took me all of Tea With Mussolini and two-thirds of Harry Potter and the Order of the Phoenix. (Seriously, how did we iron before we had videos and DVDs to distract us and make it less painful?) I found things in the ironing basket I'd forgotten I even owned. So now I'm sitting here thinking, "Well, it's time for sleep. What shall I wear to work tomorrow? I have all these choices now that everything is ironed"... but underneath it all is the certainty that I'll just end up cycling through the same four or five outfits even though my double wardrobe is packed full of clothes. Still... I did all my ironing. Wow. 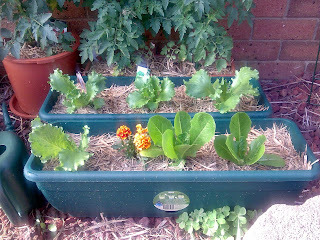 I've finally finished planting my vege garden. 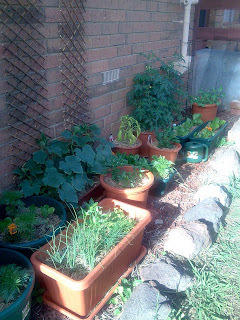 I use the term 'garden' fairly loosely - I rent and have no back garden to speak of so I've had to plant in pots. It's a ridiculously expensive way of doing it since I had to buy lots of potting mix and of course all the pots. It would probably be cheaper to buy my salads and not bother growing anything but I don't care - gardening is fun, even on a teeny scale. Here is a pic of the whole thing. Yeah, it's small, but I live alone so there's actually more there than I can eat. 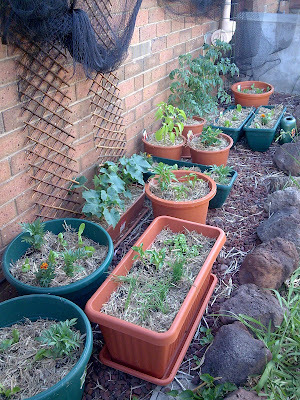 From the foreground to the far end we have cos lettuce and iceberg lettuce (with marigolds to keep down the bugs), then a herb pot with spring onions, chives and basil, some yellow capsicums, chilli, mini red capsicums, apple cucumbers (the little, round, white ones), grape tomatoes, some more lettuce, strawberries and snow peas. And look! 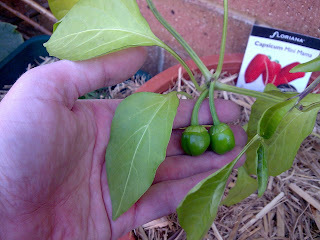 My capsicums are pregnant! So are the tomatoes but the picture was blurry. 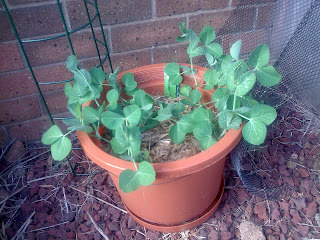 Fingers crossed they'll live long enough to harvest. :) It's very satisfying, anyway... which is a surprise to me because I've never been interested in gardening before. I'm sure if this process had involved digging and spading (is that a word?) I would have lost interest a lot earlier. We had a cake in home group tonight for my birthday. Usually I'm the one who makes the cakes for birthdays and I often make a 'novelty' cake, like a tiny-teddy golf course for the golfer, a calculator for the accountant, etc. As it was my birthday the group decided I should have a break from cake-making, so much discussion ensued about who would make the cake and what kind of cake I should have. 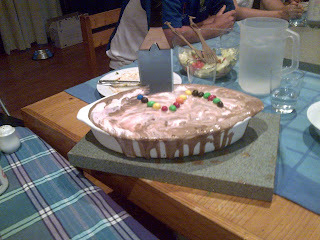 Eventually I asked for an ice-cream cake made by one of the sons of the couple who host the group. He's 16 and he's made these cakes before. It's pretty awesome - you scoop the ice-cream out of the tub, mix other delicious things with it and then re-freeze it in another bowl. For my cake he put chopped up Mars Bar in chocolate ice-cream, Turkish Delight in strawberry ice-cream and Crunchie in vanilla ice-cream. And yes, that IS a Barbie-Mate stuck in the cake. For some reason he thought that would be the most appropriate implement for cutting and serving it. Who cares what it looks like? It was a GREAT cake. I feel enormously blessed to have you in my life. Many of you became family to me when I moved interstate. Others of you are my 'family back home'... although you are scattered all over the world now. Some of you I have known for years but have never met in real life (thank you, internet). You have supported me, encouraged me, helped me in practical ways, prayed for me, welcomed me into your lives and homes, and given me some of the best laughs ever. My life is so much richer for knowing you and sharing your lives. You warm my heart and I love you heaps. After reading Givinya's meme I realised I am not alone in the universe - there are other people with quirks as weird as mine. So, working on the theory that talking about my oddities helps to 'normalise' them, here are 7 odd or unusual things about me. I'm addicted to buying notebooks. Stationery in general, really, but particularly notebooks. I've been known to spend half an hour in Officeworks just to get a mood boost... and don't get me started on Kikki.K! But here's the oddity: I am incapable of writing on the first page of a notebook. I always turn it over and start writing on the second page. Always. I have no idea why this is. It may be related to primary school when we had to draw a title page for every book...who can say? But the first page is sacred. I love cherry tomatoes, or other baby varieties like mini Roma, but I must cut them in half to eat them. Otherwise it feels like I'm biting into an eyeball. I never put the lid of the toilet down. This is deliberate - it's part of my public-toilet-lid-down phobia. Unless I'm absolutely busting and have no other choices I won't use a toilet that has the lid down. Because... who knows what horrors are lurking beneath that closed lid? I can't open a packet from the wrong end. I once gave a friend a lift from Sydney to Melbourne (no, I'm not that generous - I was driving there anyway; he just tagged along). About four hours into the 11-hour trip he started to open a packet of Jelly Dinosaurs. I glanced over as he did it and screeched "No!" Understandably startled, he asked what was wrong. I said, "I can't eat them if you open the packet from the wrong end." He laughed at my witty joke, then realised I meant it. There was a lengthy silence as he calculated the number of remaining hours he would be trapped in the car with the Crazy Lady. It bugs me beyond belief when people misuse the word 'enormity'. No, it doesn't mean 'enormousness'; it means 'great evil'. Something to think about when next you consider talking about the enormity of God's love, as I've heard in innumerable sermons. I love the smell of freshly mown grass and, oddly, the smell of brand new carpet. As I kid I used to slow down when walking past carpet stores because I liked the smell. I don't know how to drive a manual car and I haven't done a parallel reverse park since my driving test. I have no intention of learning either thing... if it means I have to park a bit further away, so be it. If you think I'm weird, think about this... I've censored these entries. That's right, these are weird things but they're not the weirdest. I've heard this little exchange so often that in some ways I've become immune to it and what it means. It sounds so matter-of-fact - "you are the Christ". It sounds like nothing. It could just as easily be "You are a carpenter" or "You're a really dynamic speaker with 12 good friends." It sounds matter-of-fact but in reality Peter is saying something amazing and history-changing. He's saying that finally - finally - the fulfilment of God's promises has come. He's saying that God is faithful. He's saying that God's kingdom is here and that the redemption of his people has begun. Even though it becomes obvious later that he doesn't fully understand what the Christ has come to do, he's saying, "You are the one who makes it possible for me to stand in the presence of the most holy God - fully welcomed and without fear." The whole weight of history is in those four tiny words... You are the Christ. People who know me in real life may be aware that I spend a little bit of time on Facebook. Okay, quite a bit of time. I'm fully prepared to justify it by saying that it's helped me catch up with people with whom I'd lost contact over the years and to keep up with friends in Sydney now that I'm living in Melbourne, etc etc. Those things are indeed true, but also I just like it - I play scrabble and other word games with friends, I check out the photos of people I don't know but who are friends-of-friends (come on, you know we've all done that on Facebook), I stuff around and waste time. It's a diversion and I like it. One feature of Facebook is the 'status update'. It's a section where you can put in a very short sentence or two stating what you're doing or what you're thinking... in the form of "[Femina] is relaxing" or "[Femina] really should do her housework but would rather play on Facebook instead". It can be pretty useful, actually, because sometimes people update their status to say important things like "So-and-so has a new job". I quite like the status update feature and like to play around with it - sometimes I'll use it to quote obscure songs or movie lines to see who can work it out. However, I'm finding lately that occasionally I'll carry on a commentary in my head as though I'm updating my status... without actually updating it. Just now I was preparing to try out my new electric line trimmer (which, by the way, was heaps of fun - oh, the destruction!) and found myself thinking, "[Femina] is happy the grass has dried out enough to use her new line trimmer." On the way to plug it in I accidentally kicked my back-door mat and discovered a massive ant infestation living under it. I immediately thought, "[Femina] was not pleased to find a huge ant colony living under her door mat." So... I'm not actually updating my Facebook status; I'm commentating my own life, for my own benefit. In the third person. No, I'm not weird. Really. So there I was... hands full of scraps headed for the bin, eyes down because I was looking at said bin... out of nowhere, a huge sneeze. An unexpected sneeze. A huge, unexpected sneeze right down my cleavage. It was every bit as unpleasant as it sounds. Just so you know. I generally do my grocery shopping at Aldi because it's way cheaper than a regular supermarket. One interesting feature of Aldi is that one section of the store is devoted to non-grocery, department store type items. This can be absolutely anything - I've seen DVD players, computers, barbecues, chairs, cement mixers - you name it; they've probably sold it at some point. I really thought I'd seen it all at Aldi but today I saw a product that made me do a double-take. They were selling.... unicycles. Seriously. Unicycles. One wheel, one seat, two pedals. I've never really spared a thought for where you'd go to buy a unicycle (not having ever been in the market for one) but I suppose I would have thought you'd have to go to a special circus-supplies stores to find one. Apparently not - just head over to your local Aldi store. For the record, I didn't see any customers buying one. Aching wounds; a cry in the dark. Stumbling feet; a path of pain. Guiding hand; shines His light. Tender heart; a silent prayer. Whispered hope; He knows my name. Mustard seed; I take His hand. I've written before about being unmarried in a very married world; and the way people in churches have trouble knowing how to treat me, and people like me. I didn't talk about my current church in that post, but for the most part I have to say I'm very happy there and I've rarely been made to feel like a freak for being unmarried. Sometimes it's unavoidable because people make assumptions about what my life is like and then act on the basis of those assumptions. And sometimes it's unavoidable because I might be having a bad day or a 'hating being single and feeling sorry for myself' day, in which case I'm going to take the most innocent comment in a negative way. However, leaving out bad days and clueless people, mostly I just feel like another member of the church community. No big deal. Tonight, however, was different. We had our church AGM and celebration dinner and mostly it was a really nice evening. Good food, lots of people there, I chatted with a few people I hadn't really got to know before, one of my friends performed a song she'd written for the evening, there was lemon sponge for dessert (shhh... don't tell any of my Bovine Buddies). It was relaxing and fun. At one point during the evening they played a DVD of different activities that have taken place over the past year, and a slide show of photos. The slide show included a full five minutes of pictures of happy, smiling couples. That's fine; I have no problem with couples. However, they were the ONLY people represented. All the other photos were of events... the only 'posed' shots of people were photos of couples. Every single one. Sure, there are a lot of families and couples at my church - by far the biggest demographic - but they're not the only ones there. Well, maybe that wouldn't have bothered me too much... until the person taking photos of the evening came up to our table. She took photos of all the couples on our table (ie, every other person at the table) and then walked away. Wow. Good way to make me feel like a fringe-dweller. I know I'm not a fringe-dweller. There are no fringe-dwellers in God's family - we're all valued and cherished. Fearfully and wonderfully made. Loved children of the creator of the universe. Really, it doesn't get much more awesome than that. I just wish sometimes that people were better at remembering that. Unfortunately, this church has chosen to put up the kinds of meaningless platitudes that are exactly the reason why people think Christians are unbelievably daggy and out of touch. I almost always cringe when I drive past it. Last week it had something like, "Don't steal from tomorrow; that belongs to God." It sounds deep but if you think hard about it, it actually means... not a lot. Plus, they didn't have the semi-colon which really bugged me. This week's saying, though, is a winner. It says, "Love is a verb." Look, I know what they're trying to say... but, being the grammar geek that I am, I drove past it and said, "Uh huh - and it's also a noun." My sister, who is not interested in Christianity in any way, suggested years ago that I should get a t-shirt made saying, "Christians can be cool". I've thought about it, but with things like this noticeboard... who would believe me?? I can't believe I'm writing this after the Operation Skinny Cow post... but perhaps it will explain why I needed to join OSC in the first place. Sausages are not good for you. They're full of fat and not much (if any) nutrition.... but I love them and I don't care how bad they are. Well, actually I do care because I try not to eat them too often, but sometimes I really crave them. Here's a tip - don't go grocery shopping when you're hungry, and definitely don't go shopping when you're hungry AND pre-menstrual (and therefore craving salty, fatty foods). I walked past my lovely butcher the other day and glanced at the sausages. I thought, "Hey, a sausage sandwich for lunch today would be such a treat." I wandered closer to the counter, and saw a sign reading, "Special - 2kg sausages for $10." Although I live alone I often buy 2kg of mince or chicken when there's a "2kg for X dollars" special on. Sausages, however, I buy 4 or 6 at a time. Never 1kg at a time and certainly never 2kg. The other day, though, I had somehow turned off my brain. I saw the sign and heard myself saying, "I'll have 2kg of sausages thanks." That's a LOT of sausages. It's really a lot of sausages when you eat maybe 4 per month at the most. You may be thinking, "Why is she worried? She can just invite people around for a barbecue." That's a fine idea, except that I don't own a barbecue. Not only that, I don't even have a backyard. A few of us were having a discussion over at Hippomanic Jen's blog and other blogs (here and here) about our efforts to lose a bit of weight. We thought it might be a good idea to start a little support and encouragement blog, so here it is - Operation Skinny Cow. So here's the deal - if you want to be involved I can set you up as an author on the blog, which means you'll be able to post. I haven't quite worked out the details fully but I thought maybe we could agree to post weekly (although more if you want) to give an update on how you're going, what's been good, what's been hard and how you're feeling. We might also have Weigh-In Wednesday, where we weigh ourselves at home and IF WE WANT we can share... eg, "I lost a kilo this week" or "I didn't lose anything" or "I'm not telling you the result of the weigh in but I'm depressed and want to eat chocolate so please post some comments and encourage me!" Remember that no one needs to know what you weigh. You can share as little or as much as you like. Anyway, if you think you'd like to be involved in this, or you have some ideas, please e-mail me at swellen1970[at]gmail[dot]com. If you want to be an author I'll need the e-mail address you use to log in to Blogger or your blog. Disclaimer: Operation Skinny Cow is not here to provide dieting, nutrition or medical advice. It is for informal support only, and you should not start any diet or exercise program without medical advice. Also, don't talk to strangers. And don't make that face - do you want the wind to change? Plus, the way he's shaking the blonde girl around at the moment I find it very hard to believe she wouldn't have had a broken spine after the first shake. Dear Peter Jackson: I'm willing to suspend disbelief up to a point, but not when you've already made me wait nearly two hours to see the gorilla. I went out on Wednesday night with a friend to see Mamma Mia. (I know - out in the middle of the week! I felt so grown up and hip and happening... although my use of the word 'hip' proves that I am a little bit to the left of 'up to the minute'...) Amongst the trailers before the film were trailers for Bonneville and The Women. I'm not particularly interested in either movie and I think it's largely because of the way they portray women's friendships. I realise this seems a little strange, given my previous post about women's friendships. There is a pretty big difference, though, between the friendships portrayed in these movies and friendships I have experienced. None of this is worthy of a Hollywood movie, unless you make one of the characters a bitter, alcoholic, cancer-ridden amputee. Despite that, I know which friendships I'd rather have. I don't want to watch movies that make me feel like my friendships aren't real unless they follow a particular pattern. My friendships are real and warm and practical and loving and I will not allow them to be devalued by a Hollywood fantasy. There's a new competition over at "Where The Blog Are You?" (WTBAY). You can win an R & R pack of DVDs and yummy chocolates, so head on over and check it out. I have a friend who doesn't like using predictive text on her phone - well, she doesn't mind it but she usually doesn't bother to change it when the phone chooses the wrong word. She also types messages in a hurry and doesn't read over them so often it's a bit of a puzzle to work out what she's said. Her new mobile has the ability to use a little keyboard rather than the number pad... she claims this will make her messages more intelligible. Well, you decide - today's message said, in part, "have you got a date in mins for xwlebratong?" Can't get it? It was supposed to read, "have you got a date in mind for celebrating?" I'm used to her messages being hard to understand but that one is a winner. Weirdly, Google Analytics has decided to stop tracking my blog. Before anyone asks, yes I have installed the tracking code correctly. It was working fine until a month ago and now it's just decided that I have not had any visitors to my blog. Evidence would suggest otherwise, since people have been commenting and people are showing up on my Clustr Map... but apparently you are all in my imagination. Sorry to hear that, as some of you seemed quite nice and I'm a bit sad to realise you don't exist. I've been tagged by Louisa. 3.Your hair color? Garnier Nutrisse Number 3! October is Beyond Blue's Anxiety and Depression Awareness Month, this week (although it's nearly over) is National Mental Health Week and TODAY is World Mental Health Day. I never thought this would be something I'd need to advertise, because mental health was never on my radar... until being diagnosed with depression last year. Even then I was able to continue in denial for quite some time because it was 'mild to moderate' depression, which meant counselling alone was an appropriate treatment. Things got worse earlier this year and I spent a number of months being unable to cook or clean or do many things that I enjoy. And I do mean physically unable - there is just no way I could force myself to do things, even if I wanted to. I have a vivid memory of wanting to do some painting (which means I was having a relatively good day), getting out some of my painting gear and then realising I would have to fill my water container, and then refill it when the water got dirty. It sounds ridiculous but that one thing made the whole task impossibly overwhelming for me. Often it is just one thing that blocks us. I didn't realise at the time that I was seeing a counsellor who wasn't helping me (ie, she was actually making things worse... I know several people who've stopped seeing her for similar reasons as me) so I kept perservering with it without seeing my doctor again. Part of it was that I didn't want to admit I was worse because I'd been seeing a counsellor for nearly a year. I was supposed to be better! Eventually a dear friend took me out to lunch and firmly told me I HAD to see my doctor. Unfortunately the anti-depressant my doctor prescribed caused a reaction so bad I had to call an ambulance in the middle of the night, but that doesn't mean I was wrong to see her, nor that the prescription was wrong. It really was just one of those freak things, and despite the outcome I should have gone to my doctor a long time before I did. I ended up changing counsellors and that made a huge difference. I started to feel a lot better several weeks after I started seeing her, so much so that I didn't need to try another anti-depressant - but I acknowledge that's certainly not the norm. Even for me it wasn't overnight. Now that I'm feeling so much better I'm realising that I was actually mildly depressed for a long time, - probably three or four years - and I'd just developed coping mechanisms. Eventually the coping mechanisms no longer worked for me and so I slid into a deeper depression. I think that if I'd been more aware of depression... if depression didn't still have a stigma... then I would have sought help a lot earlier. And this is why I'm now keen to support Beyond Blue and similar organisations, and why I'm keen to get the word out about depression and mental health. WHY would a publishing company get to book FIVE in a series and then change the cover so that book 5 doesn't match the other four?? I've just bought Jasper Fforde's First Among Sequels, after waiting a loooong time for it to go to paperback in the regular size (not trade paperback size) and... they've changed the cover! The most annoying thing about this is that when it was in trade size and hardcover it had a cover that matched all the others... but they went with a new one when they reprinted. It doesn't match, and yes, that bothers me heaps! Say what you will about Macca's - and believe me I've said it all - but I have to say there's something appealing about a thickshake so thick you wonder if it really is possible for your eyes to pop out of your head. I guess I'd need some sort of controlled experiment to properly resolve the question but I can confirm they didn't pop out this time. I live to drink thickshakes another day. Currently I'm reading a book called Writing as a Way of Healing: how telling our stories transforms our lives, by Louise DeSalvo. Possibly I shouldn't review it yet as I'm not quite finished reading it but it's so good I couldn't wait to share it. The book talks about writing (journalling, fiction, biographical narrative) as a way of working through trauma. The author is very careful to note that this should never be the only method; she strongly suggests that people should have good support structures in place, including counselling, when working through things. What I found very interesting about 'writing through pain' is this: studies have shown that not all forms of writing are beneficial and some may actually be slightly harmful. She draws heavily on the studies of psychologist James Pennebaker, who did a writing study with three groups of university students. He asked all three groups to write about a significant event that they'd never shared with anyone before. The first group was instructed to write only about the events; the second group was instructed to write only about their feelings; and the third group was instructed to write about what happened and the way they felt about what happened. Pennebaker found that the third group almost without exception reported that they believed writing about the events and their feelings helped them to resolve their feelings and work through the pain of the event. Additionally, the third group reported fewer visits to doctors and fewer illnesses after the writing task, while the second group, who wrote only about their feelings, reported more illnesses and medical visits. DeSalvo gives good, practical advice in this book. The first section of the book is devoted to explaining the benefits of writing and explaining how to write in ways that are beneficial, including how to get started. That section was helpful because for some people the events are so traumatic that they don't feel able to write about it at all. The author addresses that and has good suggestions for how to write about other things that will lead slowly to the event in question, or how to write about other aspects of the trauma. The second section of the book is practical advice about writing itself, including planning, writing every day even when you don't feel like it, writing without inspiration, and keeping a journal about the writing process. She debunks myths like the idea that books appear fully formed in a writer's head, that writing should only happen when one has a great idea, and that if writing is difficult it means you're not a real writer and should stop. Readers of my private blog will know that I've been dealing with some significant issues in my personal life and I'm only a little way into the healing process. Obviously I've always found writing helpful (2 blogs and several journals on the go at the same time will testify to that) but writing in the way suggested in this book has been enormously helpful to me. Once I got started I couldn't stop and I can definitely see the difference between writing in this structured way and just pouring out my feelings. There's a place for pouring out feelings but ultimately it doesn't resolve things. The type of writing I've been doing while reading this book has been helping me begin to grieve, finally, some traumas that happened a long time ago. It's going to be a long process and I don't think writing alone should be the only method of healing (I definitely needed to debrief with my counsellor after some things) but I'm finding it an extremely beneficial addition to the mix of help I've been utilising. You can check out the book here... although if you plan to buy it I would suggest searching on Bookfinder or AbeBooks for a cheaper copy.